Is Whitening Before the Holidays Worth the Expense? Whitening is a cost-effective cosmetic procedure that greatly enhances your self-confidence. And the benefits you get from feeling good about yourself can’t be over-stated, especially at the holidays. In fact, countless studies have found that people who have a nice smile are perceived as more likable, intelligent and attractive than those who don’t! Also, whitening is one of the least expensive cosmetic procedures available, and the results last a long time. After your whitening treatment, you can use a whitening toothpaste to remove the surface stains you get from things like coffee, tea, and red wine and maintain your results as long as possible. And while everyone needs periodic touchups (on average, once a year) to keep their teeth looking their brightest, the only thing you need to buy again is a refill of professional-strength whitening gel from a dentist. It’s a great value because you’ll continue using your custom-made trays for many years, which is the bulk of the initial expense. Many people try to whiten their teeth with over-the-counter products, but that can wind up costing you more in the long run. Since the FDA limits the strength of these products, you won’t get the same results you can get from professional treatments. 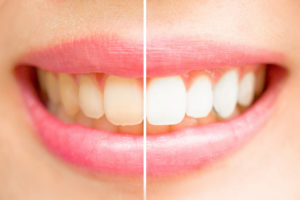 In-Office Whitening – This procedure gives fast, dramatic results in about one hour, which makes it the ideal choice for any patient who wants to get their results right away. Take-Home Trays – This option is more gradual and requires wearing custom-made trays filled with whitening gel for 30-60 minutes a day, for about two weeks. With one of these whitening treatments, anyone can safely and reliably get a beautiful smile that they can feel good about – just in time for the holidays! As a general, restorative and cosmetic dentist in Millburn, Dr. Dane Avondoglio is a firm believer that having a great smile enhances his patients’ lives, especially during the holidays. He’s found that whitening is one of his most popular procedures because it’s a fast, effective way to get great results. If you’re thinking about whitening for the holidays and want to know more, he can be reached via his website or at (973) 921-9097.